Want to feel old? This is what Pac-Man looks like today! Happy birthday Pac-Man, you large, yellow, ghost-chomping hero. Originally released on 22 May 1980, the game is 35 today, and publisher Bandai Namco is making sure we all know about it. For starters there's a new update to the iOS app that brings with it multi-player functionality, a variety of new mazes and some in-game pro-tips to help you boost those high scores even further. Pac-Man's creators have also decided to launch a 3D-printed model of Pac-Man into space via helium balloon. The stunt is a tie-in with the character's upcoming appearance in Sony's Pixels movie. We've also been supplied with some stats about Pac-Man to mark the momentous occasion. 90% of Brits say they would instantly recognise Pac-Man, a sign of the game's enduring popularity. We assume the other 10% would mistake him for "partially eaten yellow pie". Also turning 35 this year are Kim Kardashian West, Ryan Gosling, Channing Tatum and Kelly Brook. 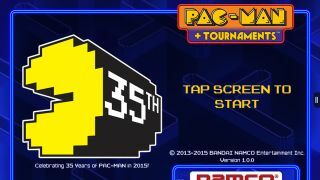 Dare we say Pac-Man is looking the best of the bunch as he heads towards 40?